Learn everything you need to know about Cote Rotie with a complete guide to all the best wines, top vintages and producers with tasting notes, wine and food pairing tips and information on the vineyards, winemaking and detailed profiles for all the best producers in the appellation. Overview of Cote Rotie: Cote Rotie is perhaps one of the most, elegant, seductive wines in the world. At their best, they offer depth of flavors and complex aromatics including bacon fat, black and red fruits, kirsch, mineral, pepper, earth, spice and floral scents. The best Cote Rotie wines offer freshness in the finish, coupled with pure red and sometimes darker berries. The wines are most often medium to full bodied wines with sensuous, silky textures that caress the palate with exotic sensations. Viognier grapes add a finesse, floral and white fruit element, along with an exotic quality to the wines when blended. The stems from Viognier can also provide a black pepper component to the wine as well. Due to the small size of the Cote Rotie appellation, coupled with the increasingly world-wide high demand for their wines, the prices for most Cote Rotie wines are high, but they can be worth it. I buy these wines for my own collection. The wines at their best provide some the most exciting tasting experiences possible from a bottle of wine. On the one hand, as I mentioned, they can be pricey. But when you factor in how little wine is made, and consider the backbreaking labor needed to farm these vineyards, and the extreme, stylish, high quality, I’m often amazed that these cost as little as they do. But let’s agree to keep that a secret. History of Cote Rotie. Cote Rote was first planted by the Romans under the rule of Caligula. At the time, the region was known as Vienne. The region began to attract local recognition once again in the mid to late 1700’s. At the time, most of the wine was sold to locals as transportation was difficult. This started to change in 1829, thanks to the advent of steam ships and again in 1855, when shipping by rail become cost effective, making it easy for wine to be transported to the much larger city of Lyon. During the 1800’s, Cote Rotie lagged behind Hermitage in price and stature. This can be seen in prices paid for the wines in those days. It was also due in part to the fact that Cote Rotie was viewed as more elegant and naturally lighter in color and tannin. That elegance, which we now treasure, was not seen as positive in the days when wines from Hermitage were blended with Bordeaux and Burgundy, to add backbone, tannin and color to their wines. Like the majority of Europe, the vineyards were devastated by Phylloxera in the late 1800’s. All of the hillside plantings were completely decimated and did begin to not fully recover until after World War 2. This was because there was no demand for the wine of Cote Rotie. The depression era did not help, as the hillsides were too difficult and expensive to re-cultivate. Between World War 1 and World War 2, land owners made more money growing apricots and cherries than they could by selling wine! To give you an example, Cote Rotie was selling for less than 1 Franc per bottle in those days! A ton of fruit sold for more than a ton of grapes. And that does not even take into consideration the cost of cultivating a vineyard, especially on the steep, rocky, terraced, hillside terrain. It really took the arrival of the energetic, passionate, Etienne Guigal in 1946 to the region to bring the wines to the forefront of the world wine stage. The revival of the fortunes for Cote Rotie started to take place in the late 1960’s. The next generation of producers that began reinvigorating Cote Rotie was headed by Gilles Barge, Antoine Chambeyron, Marius Chambeyron, Marius Gentaz, Jean Dervieux, Jasmin, Joseph Jamet and most importantly, Joseph Vidal Fleury, who had the luck, or foresight to hire the unstoppable, Etienne Guigal. Jaboulet was already active as a negociant in the region by this time as well. While more land was being cultivated in the 1970’s, many growers were still planting apricots, cherries and vegetable in order to earn a living. It took until the late 1980’s, with 4, top vintages in a row, (1988, 1989, 1990, 1991) for the growers in the region to begin earning enough money to become full time vignerons. The most important change in the appellation taking place since the early to mid 1980’s is the number of growers producing, bottling and selling their own own wine continues to increase. Previously, a large percentage of growers sold their harvest to negociants or cooperatives, as being a winery was not the best way to make money. Today, at least 60% of the growers are making their own wine, which is great as it offers more terroir driven wine to thirsty consumers. Growers are also striving to harvest their fruit when it’s phenolically ripe, when possible. Other improvements to the region have been the trend for many of the modern styled producers to produce single vineyard wines. Guigal became the first producer in the region to begin producing a single vineyard wine, when they released the 1966 La Mouline. Prior to 1966, and for even several years after that, every other producer made wines that were always a blend of lieux-dits. The trend for modern and even traditional domaines is to produce single vineyard wines. There are examples of that are the only property making wine from specific lieu-dits. There are also famous vineyards owned by different producers, for example La Landonne, which 5 winemakers make a single vineyard wine from: Guigal, Gerin, Rene Rostaing, Delas and Xavier Gerard. Another recent trend several estates have adopted is differentiating between their young and old vines, meaning they can have two different wines, one is produced from their young vines, while the other bottling is made from their older vines, often referred to as a Vieille Vignes. The best vintages of Cote Rotie: are: 2018, 2017, 2016, 2015, 2012, 2010, 2009, 2007, 2005, 2003, 2001, 1999, 1998, 1995, 1991, 1990, 1989, 1988, 1985, 1983, 1982, 1978 and 1961. In the riper vintages that allow for phenolic ripeness, the wines will be more expressive, taking on additional seductive qualities. In the good, but slightly less ripe years, the wines will often display fruits with crisp, red berry characteristics coupled with more freshness, along notes of black pepper, spice, tannin and acidity. While most Northern Rhone appellations will have similar levels of quality in the same vintage, that is not always the case. For example in 1991, a historic year of quality for Cote Rotie, Hermitage is not quite as successful. More importantly, vintage quality in Cote Rotie and the Northern Rhone are not always the same as you will encounter in Chateauneuf du Pape all the time. If you’re seeking vintages with some age that offer good price to quality and value ratios, look for 2001, 1998 and 1997, are all vintages that produced good wines and they sell for prices that are below their level of quality. Cote Rotie can be difficult to find as the wines age because they are produced in microscopic amounts. Plus the demand can be quite strong. A 1,000 case production is considered huge! Most producers bottle under 500 cases for the world. Many producers are making closer to 300 cases or less, which means that many of these wines are impossible to find in older vintages. If you think 300 cases is small, think about this, there are several top, single vineyard Cote Rotie wines being made today with productions that average between 100 and 200 cases! #1 Only red wine is allowed to be produced in Cote Rotie. #2 Cote Rotie was first planted by the ancient Romans under the rule of Caligula. #3 Just two grapes are permitted in the Cote Rotie appellation, Syrah and Viognier. The rules of the appellation allow for up to 20% of the white wine grape, Viognier to be included in the blend. #4 Cote Rotie has some of, if not the steepest hillside vineyards in Europe with heights of more than 330 meters, or 1,150 feet! The gradient can be up to 60 degrees or more in some of the steepest parts of the rocky, hillside, terraced plantings. #5 Very little wine is produced in Cote Rote each year. This often comes out to less than 80,000 cases of wine per vintage for the entire world. #6 When looking at the two hills of Cote Rotie, it’s easy to tell them apart. The Cote Blonde has lighter colored soils, due to the type of sand, limestone and rocks in the soil. The Cote Brune terroir is darker in color, because of its deeper toned, brown and red hued clay and iron rich soils. #7 Many wine lovers consider Cote Rotie to be among the finest and most exotic wines in the world. #8 Cote Rotie is as far north as you can get in the Rhone Valley. If you go any further, you will end up in Burgundy! #9 While it was known that Cote Rotie produced stunning wines, most of the recognition was known primarily by the locals. It was the arrival of Etienne Guigal and his non stop promotional efforts that helped propel Cote Rotie and its wines to their current level of world wide fame. #10 Prior to the rediscovery of Cote Rotie, the region had fallen so far from favor that by the 1960’s, only 60 hectares were still under vine. Many land owners made more money by planting apricots than growing grapes for wine. The old rule of the more things change, the more they stay the same does not apply here. Size of Cote Rotie vineyards Cote Rotie is a small appellation at the top of the Northern Rhone Valley. In fact, Cote Rotie is the northern most appellation in the Rhone Valley. The region is small. As of 2019, only 310 hectares of vines were planted in the Cote Rotie appellation. There is some room to expand. Many growers think the maximum amount of planted hectares could increase up to 350 planted hectares. Although, legally, there is room for as much as 490 hectares of vines. There are three communes that create the region, Ampuis, Saint-Cyr-sur-le-Rhone and Tupin-et-Semons. Those three communes can be further divided into 73 different, small vineyards or lieux-dits. More than 100 growers are active in the appellation today. Perhaps 60 growers are making their own wine in Cote Rotie, the remainder sell their harvest to negociants, local co-operatives or other growers. If you think the region is small now, in the 1970’s there were only 73 hectares planted. By 1982, the region was only 102 hectares! If you travel back to the 1940’s, at the time the official AOC was granted, perhaps less than 50 hectares were planted with vines! Over the years, the appellation has slowly increased in size. Cote Rotie became an official AOC appellation in 1940. The refusal to continue increasing the boundaries of the appellation is part of the reason the quality of the wine remains high. Cote Rotie Terroir and soils: Cote Rotie is translated into the roasted hilltops, which clearly explains and expresses the unique terroir and vineyards of the region. It’s less than half an hour from Lyon by car, close to the small village of Ampuis and not more than 30 miles north of Hermitage. The best vineyards are situated high on the hills, which are on truly steep, rocky inclines. The best vineyards feature a south or south eastern exposure. The hillside vineyards begin at the bank of the Rhone river and reach elevations of 330 meters, or 1,150 feet. The steepest inclines can reach up to 80 degrees in some parts. The rock strewn terroir of the region makes it difficult to plant, grow and harvest vines. The vines need to be able to withstand the wind, which can be fierce at times and the natural erosion of the rocky, mountainous inclines. To help combat the erosion, the appellation’s vines are planted and trained to help withstand the twin local dangers of both high winds, coupled with issues caused by soil erosion. It’s truly backbreaking work for the vineyard workers and harvesters, due to the incredibly steep hills, elevations and rocky terrain. 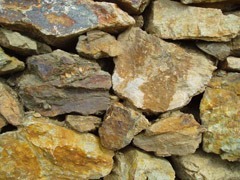 Many of the vineyards are planted on terroir with granite, sandy granite, gneiss and schist rock with mica in their soils. The granite and schist stones found in the soils can in the right climate, create highly acidic soils. When the weather turns humid, that can even exacerbate the acidic conditions. You find more schist rock and darker soils in the northern part of the appellation on the Cote Brune. Just a bit south, there is a larger concentration of granite, gneiss and lighter shades of soil on the Cote Blonde. At the extreme south, much of the soil is dominated by granite. Due to the nature of the soils, as you have read, it’s easy to see why erosion is a common problem with many of the top hillside vineyards. An integral part in shaping the terroir, and of course the style and character of the wines is the windy climate. The winds that blow through the region are known as La Bise, which head into the region from the north. Cote Rotie is also much cooler than the other Northern Rhone appellations, which adds more freshness and acidity to the wine. Cote Rotie enjoys a temperate, slightly cooler terroir than the rest of the Rhone Valley, due to its location in the northernmost part of the appellation. While the grapes enjoy, warm sunlit days, the mornings can be quite foggy. The region averages 2,100 hours of sunshine per growing season. It rains close to 800 Millimeters, (31″) per year. Those climatic conditions, coupled with the unique, stark terroir are just perfect for the only two grapes allowed for planting in the appellation, Syrah and Viognier. 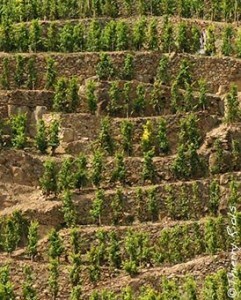 To combat the dangers of erosion, growers on the steep terrains often build a series of terraces and can from time to time traverse the terrain for the variety of rocks and stones that have fallen down the hillsides, the vines warm as they radiate heat and sunshine, which helps the grapes reach their desired level of ripeness. The terraces are probably constructed in the same manner as they were thousands of years ago when the Ancient Romans first cultivated the region. They are held together without the use of cement in most cases. These terraces require a lot of hours to maintain them. Some growers have removed them in the stonier, schist terroirs, which should work, unless there are violent storms. Organic farming techniques and biodynamic farming practices continue to expand and gain in popularity in the appellation. The best terroir is located on the steep slopes and hillsides, with the top terroirs being found in the two tall hills with steep elevations of Cote Blonde and Cote Brune. When we said steep, we mean it as the gradient can be up to 60 degrees, making it extremely hard to work the vines. The two slopes are naturally divided by the Reynard stream, which runs through the village of Ampuis. The hills in reality include steep inclines, slopes and flatter areas as you travel down the hillsides. It is important to keep in mind that the reality of Cote Rotie is that the region is not split into two main parts, Cote Blonde and Cote Brune, While those are the hills where the vineyards are planted, Cote Blonde and Cote Brune are also both lieux-dits. Each area takes up about 3% of the appellation. There are close to 50 lieux-dits, or vineyards in Cote Rotie in total. The Cote Blonde and Cote Brune hillside vineyards are truly quite, uniquely different terroirs, with each making different styles of wine. Cote Blonde is the larger of the two hills. with a terroir of sand, granite, schist rock, and limestone soils. Those elements create a lighter colored soil than you find in the Cote Brune lieu-dit. Cote Blonde is located slightly south of Cote Brune, giving it a south by south east exposure. Cote Brune is the smaller of the two hillside lieu-dits. Located to the north of the appellation, it has a terroir of clay and iron oxide along with granite, mica, schist rock and limestone soils. Those elements create a darker colored soil than you find on the Cote Blonde. These differences in terroir explain the power and more masculine style of wine from the Cote Brune, versus the opulent, lush qualities found in Cote Blonde wines. Interestingly, the wines produced from each hill clearly display their soil heritage. The wines from the Cote Brune are darker, more tannic, meatier, firmer, stronger and more austere when young. The fruit expressions are slighter darker. The wines often require more aging time in the cellar. Wines from the Cote Blonde are softer, silkier, slightly lighter, with more elegance and floral character. They can definitely display more sensuous attributes. The fruit expressions are slightly brighter, favoring dark red berries just a bit more than than the Brune. The wines can drink well at a younger age. The style and character of Cote Rotie wine: The wines of Cote Rotie age very well. Generally speaking, Cote Rotie are not much fun to drink young. They can be quite bright and tight. Many Cote Rotie wines, especially from the better producers need a decade or more before displaying their charms. As the wine matures, the often, rich, concentrated, tannic, bright, crisp, ripe, black raspberry and dark cherry flavors morph and begin to display some of the most sensuous textures of any wine on the planet. The seductive qualities feature not only decadent textures, but complex aromas of cherry liqueur, tobacco, pepper, earth, spice and bacon fat. The best Cote Rotie wines can age for for 20, 30, 40 or more years. Cote Rotie with wine and food pairings: Cote Rotie wine with food makes for great and versatile wine and food matches. Grilled beef, lamb, veal and pork, chicken, game, duck, stews, braised foods and fish dishes are all great pairings. Cooking with bacon is perfect as it creates a natural aromatic, wine and food match. It is common for producers to make fish dishes with bacon to pair with their wines. Cote Rotie can also pair well with a myriad of hard and soft cheeses. 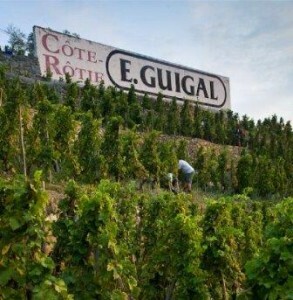 Guigal is the number one name synonymous with Cote Rotie. Not only are the top wines from Guigal the best wines of the Northern Rhone, it is in large part, thanks the efforts of to Etinee Guigal that all the wines of the Northern Rhone have earned the worldwide fame they enjoy today. Prior to Guigal’s entry into Rhone valley, while the wines by some producers were good, and earned some fame, there was very little demand for these or any Northern Rhone wines. Today, that is not the case. Consumers clamor for the wines and this can been by the ever increasing prices for the wines from the region, especially as they age. As a wine production area, there is a long history for Cote Rotie in the Northern Rhone region. The ancient Romans are known to have planted vines in the area. It’s quite easy to spot Roman ruins throughout the region. The top producers in the appellation are generally speaking, small, family owned domains. Guigal and Chapoutier are the only large wineries in the appellation. The production of Chapoutier is dwarfed by that of Guigal. Grape varieties in Cote Rotie: Syrah is the only red grape allowed in the Cote Rotie appellation. It is also legally permitted for vineyards to devote up to 20% of their vines for Viognier. However, that is quite a lot of the variety and most vineyards that include the white wine grape varietal usually limit it to less than 10% of their vines. The average is usually between 3% to 5% of the blend. If you look at the entire Cote Rotie region, 95% of the vineyards are planted to Syrah. Wineries that include a portion of Viognier in their wine use it to add floral scents, sweetness, depth and exotic textures. 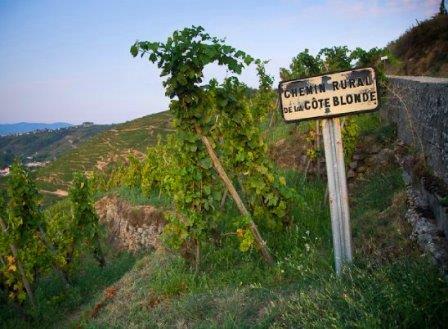 More Viognier is found on Cote Blonde than Cote Brune. Cote Rotie and the nearby appellation of Condrieu are the true homes of Viognier. Viognier is usually planted in the south of the appellation, on the Cote Blonde, in the loose gravel soils, similar to what you find in Condrieu. Making wine in Cote Rotie: There are several styles of wine in Cote Rotie. For ease, they can be divided into two categories, traditional or modern. Determining the style of wine begins during the growing season and becomes paramount, when deciding when to pick, which determines the level of ripeness in the grapes. Modern styled wines seek a higher degree of phenolic ripeness when possible. That is not the case with traditional estates that might prefer more freshness, or higher levels of acidity in their wine. Following the picking, the next decision that must be made is whether they want to destem all or part of their grapes. This should be determined by the quality of the vintage and the level of ripeness found in the stems and the grapes. Traditional estates will leave varying levels of stems on the grapes that range from all to only a portion. Modern producers, seeking less greenness and softer tannins will remove most or all the stems. Prior to the mid 1980’s, few estates destemmed. Many growers preferred to vinify their fruit using whole grape bunches. That is no longer the case today. If Viognier is going to be added to the blend, the producer will always co ferment the different varieties. Vinification often takes place in large, temperature controlled stainless steel tanks at most properties. A few older, traditional domaines still use cement vats. AOC laws dictate that for estates adding Viognier to their wine, the two grapes must be co-fermented. The varietals cannot be blended together after vinification. To add more color to the wine, there are produces that use the saignee method of bleeding the vats. This is most often practiced from estates with vines on the bottom of the slopes. Pump-overs and cap punching are preferred over delestage, which is emptying part of the vat and then refilling it. To age the wine, some of the top Cote Rotie producers use 100% new French oak barrels to age their wine, most notably, Guigal with its famous trio of La La wines, La Mouline, La Turque and La Landonne as well as the special cuvee from Ogier Belle Helene. Other top producers use closer to 50% or less new oak barrels. There are more traditionally minded producers that do not like the influence of new oak barrels and can use as little as 10% new, French oak barrels to age their wines. Other domaine’s, with a more traditional approach prefer to age their wine in demi-muids and a few more staunch traditionalists use large oak casks that range in size from 12 hectoliters up to 25 hectoliters. The time in oak barrels for aging varies from producer to producer, with most wineries aging their wine for up to 18 months. The top wines of Guigal used to age their wine for up to 42 months in 100% new, French oak barrels. Today, the wines spend less time in oak at Guigal, as the time the wine spends in barrel has been reduced to about 36 months.